Offroad drivers have quite rightly been maligned and badmouthed in many parts of Africa because of cowboy driving which is environmentally destructive to highly sensitive ecosystems. It is the responsibility of all offroaders to behave in an environmentally sensitive way, or we could see former recreation areas being declared off-limits to us. Driving off established tracks destroys ancient life-forms every metre of the way. Always stick to existing tracks. Every time you leave an established track, a new scar is created on the landscape, and the chances are good that someone travelling after you will follow your tracks thinking it is an established route. When forced to traverse a section of desert where there are no tracks, try to drive in dry river beds. Here, vehicle tracks will be washed away in the next flash flood. Beach driving should be avoided unless you have no other option. Lower your tire pressures to avoid compacting sensitive areas (and to give better flotation) Try to stick as closely as possible to the wet sand area below the high tide mark where, because of wave action, the sand is tough and resilient. If this is not possible, drive as close to the high tide mark as possible. 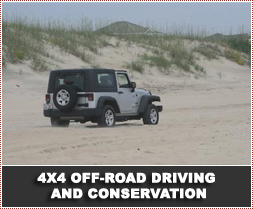 Never ever drive on beach dunes. They are perhaps the most dynamic and vulnerable part of beach ecology; constantly changing building blocks which hold the beach together. The backshore section, mud flats and salt marshes are all environmentally fragile and must be avoided. One vehicle bogged on a bush track can destroy a road in just a few days as heavy rains gouge the initial hole into an erosion donga. When you bog down - in dry or wet weather - repair the hole afterwards. Divert any streams running through the danger area and mark the hole to warn other drivers. If you use firewood or branches to improve traction, remove them afterwards. They can cause terrible damage to the brake and fuel lines and electrical wiring of other vehicles. Bull bars are there to protect your vehicle, not to bash your way through the bush for the fun of it. Doing so destroys vegetation. When winching off a tree, use a commercially available tree saver, a collar of thick rubber or a wadded up sack to protect the bark. Winch cables cut into the bark of a tree, ring barking it, and virtually guaranteeing it will die.